Weight loss. Aside from being the perennial goal of roughly half the world’s population at any given time, it’s also a vibrant, thriving segment of the commercial sector (the former, incidentally, is not unrelated to the latter). Of course, with weight loss being such a widely and ardently pursued goal, everyone wants to know the secret of success. There are, it seems, as many diets as there are stars in the sky, but most of them are flashes in the pans or outright flops. The low-carb diet, on the other hand, is a different matter. A proven tool in the battle to shed pounds and feel great, nutritious low-carb foods have seen many a person, be they overweight, diabetic, or otherwise unhealthy and unhappy, transform themselves into the fit and fabulous person they’ve always wanted to be. If that sounds like something you might be interested in, then the following guide is for you. 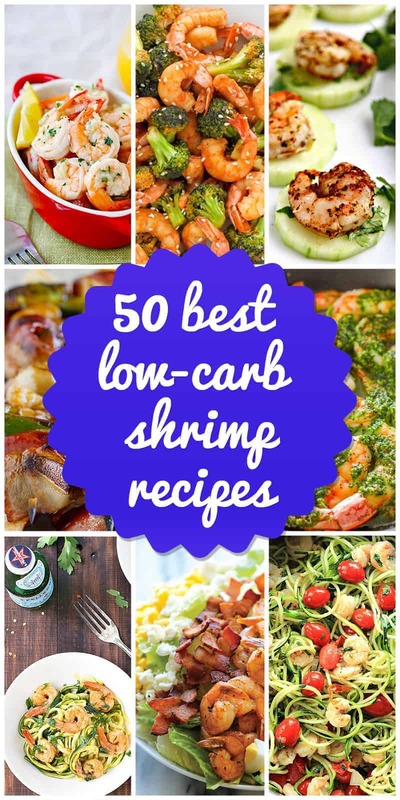 In it, we’ll be taking a look at 50 of the tastiest, healthiest low-carb shrimp recipes out there. Anyone can make them – all it takes is a bit of time and desire. The recipes are below, pictures included, so there’s no time to waste; it’s time to cook. Let’s get started! The smoky flavors of the chipotle pepper and the bright tones of lime juice are a classic combination used by grill-masters everywhere. Why not join them? 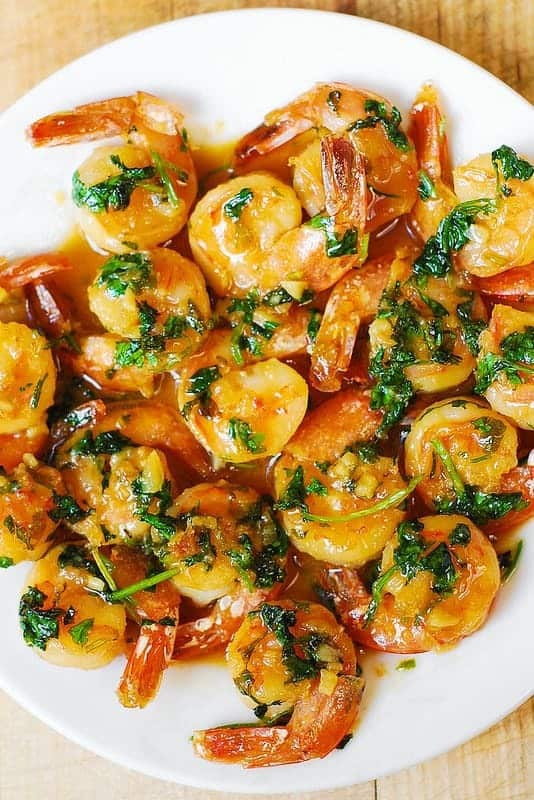 You can marinate your shrimp in this simple concoction, or jazz things up a bit with add-ins like cilantro, honey, garlic, and so on. Oh, one more thing: Not only do these low-carb Chipotle Lime Shrimp skewers taste great on their own, but they also work great as part of a larger recipe. This next recipe is a real low-carb lifesaver. Not only can you count this as a staple in your collection of virtually carb-free shrimp recipes, but it’s also one of those things that just happens to be super quick, super easy, and totally customizable in the preparation department. 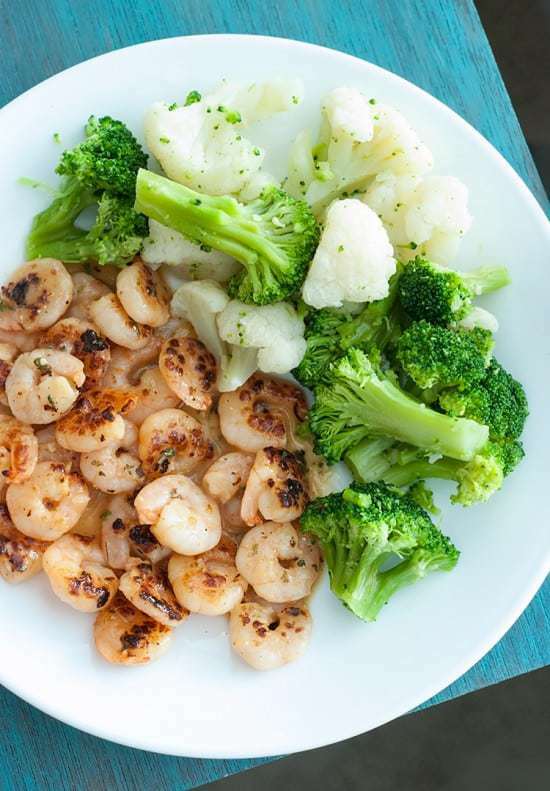 Simply saute your shrimp with garlic, oregano, some Italian dressing, and serve with a steamed veggie side. You’ll feel like you’re in Rome, and it’ll only take you 10 minutes to get there! Another Italian dish with a twist, this one’s for all you pasta lovers out there who might think a low-carb diet means you have to leave your comfort foods behind. If that’s you, well, all you’ll need is one buttery, lemony, garlicky bite of this Zucchini Shrimp Scampi to change your mind. Spiral-cut (and totally fork-twirlable!) 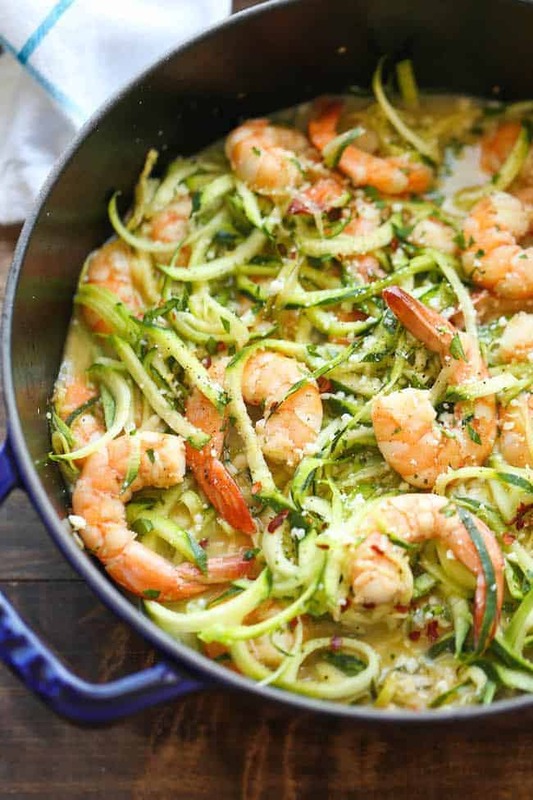 zucchini strands take the place of traditional noodles; the rest of the ingredients are just what you’d expect from a delicious shrimp scampi – with a little red pepper thrown in for zing, of course. Would you like an appetizer or light meal that’ll be on your plate so quickly it’s like you didn’t even have to make it? 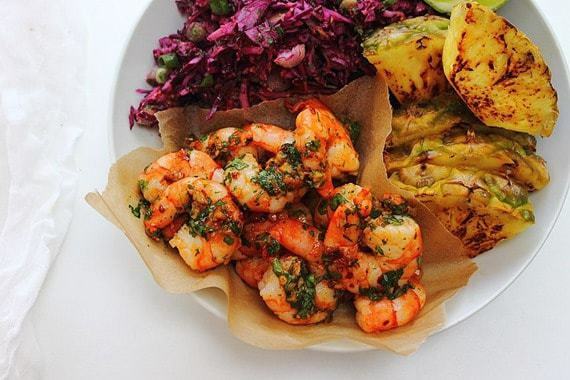 This is the low-carb shrimp recipe for you. Careful, though, these things are addictive! Bite-sized popcorn shrimp tossed in garlic, red pepper flakes, and lemon juice (among other things) burst on your tongue like fireworks of flavor. Don’t be surprised if people ask you for the recipe on a regular basis. Fried rice fans, rejoice, because you’re about to experience low-carb nirvana. This cauliflower rice bowl is packed full of color, flavor, and nutrients in its natural form – tons of crisp veggies, tender shrimp, scrambled eggs, and vibrant seasonings will do that – but you can also experiment to your heart’s content, throwing in different additives to suit all tastes. 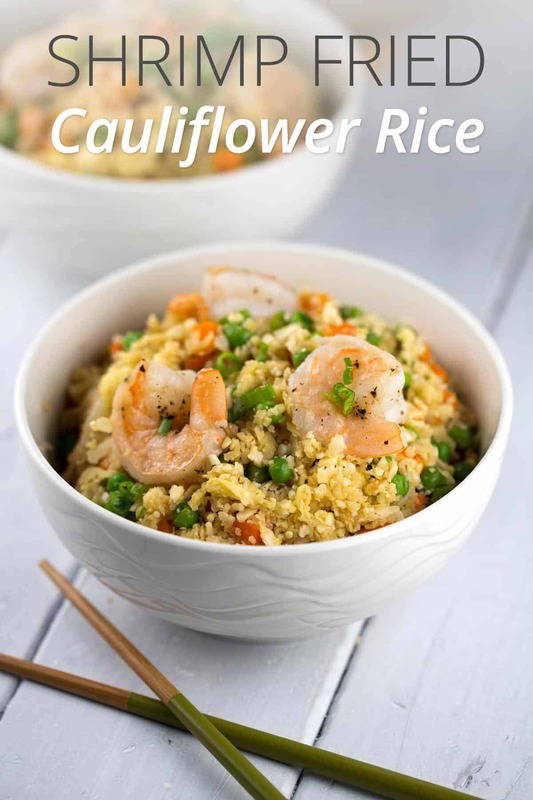 The star here, is, of course, the use of shredded cauliflower florets in lieu of traditional fried rice; it’s what makes this almost no-carb shrimp recipe such a natural addition to anyone’s low-carb diet plan. 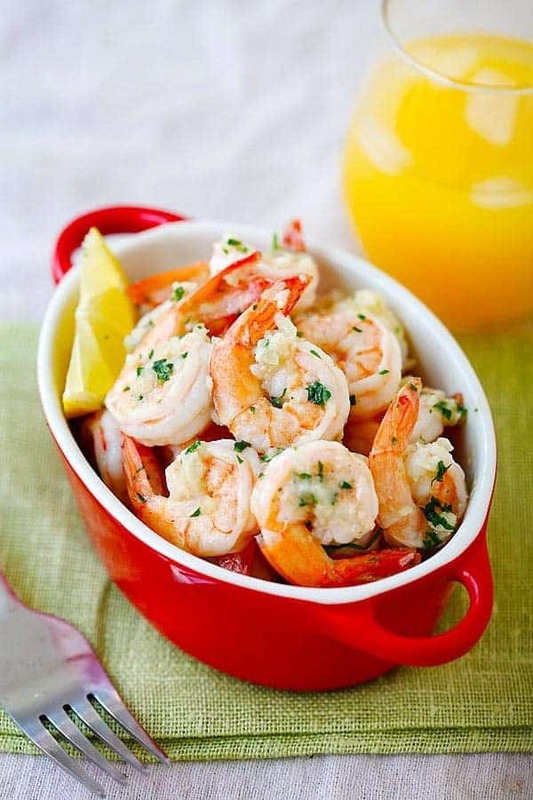 Harness the flavors of summer with these Lemon Garlic Shrimp! Tossed in all the light, zesty flavors of the season, your mouth will be watering, but fear not; this dish only takes about 20 minutes to whip up. Better yet, this is one of those low-carb foods that seems almost purpose-built to be a party dish. Grab some friends, throw on some Netflix or the big game, and chow down. You’ll be extremely glad you did. 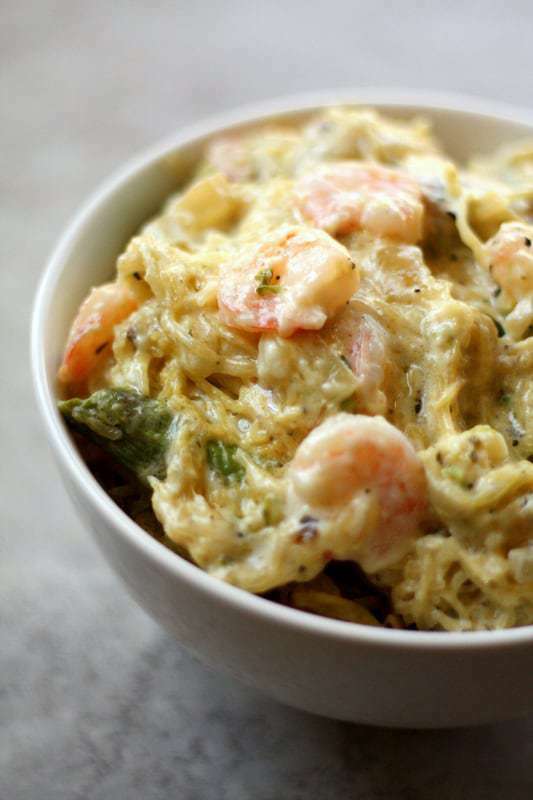 If you’re trying to trim your waistline and add muscle without a lot of effort, recipes like this Light Spaghetti Squash Shrimp Carbonara are just what the doctor ordered. Clever substitutions – spaghetti squash “noodles” and a creamy broth of Parmesan cheese, chicken broth, and egg yolks, for instance – mean you get all the deliciousness of the traditional carbonara recipe without the fat and carbs that normally come along for the ride. There’s even bacon crumbled atop all the succulent shrimp that goes into this dish. Honestly, what more could you ask for? 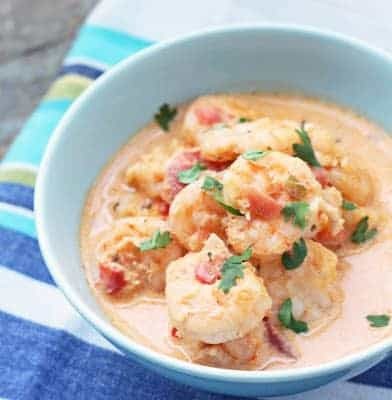 A great idea for when it starts to get chilly, this is one of those low calorie shrimp recipes that just screams “comfort food”. Full of homey yet healthy goodness, you’ve got all the tasty essentials for a great soup: Fresh spinach, heavy cream, garlic, onion, and a bit of Parmesan for garnish, and of course, lots of fresh shrimp. Serve piping hot, curl up with a book, and let Old Man Winter blow himself out. Hint: Got a cold? Add hot sauce or some red pepper flakes and cure thyself! So, you’ve got a party in an hour and you forgot to make an appetizer, or you burnt it, or the dog ate it. Either way, you’re screwed – or are you? Not if you’re reading this recipe guide, you aren’t! Instead, you’ll know to relax and whip up a couple platters of these Garlic Parmesan Roasted Shrimp. Add some cocktail sauce (or just eat them plain, they’re that good), and your guests will be over the moon. Not bad for an almost no carb shrimp recipe that takes about fifteen minutes to make, eh? If you’re on a low-carb diet, you’re not going to find a much simpler way of sticking to it than by following this next low-carb shrimp recipe. 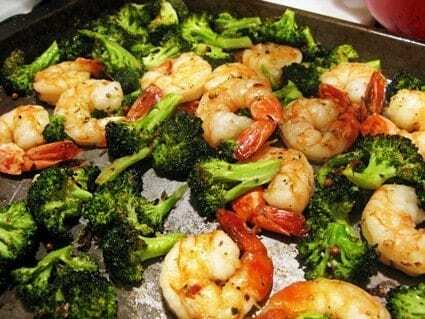 Take some broccoli and roast it with some Parmesan, lemon, and spices, and toss it with a healthy serving of big, juicy shrimp. By their powers combined, you’ll get one of the tastiest, simplest low-carb foods imaginable. Curious? Well then, whip some up and chow down! If you’re someone who enjoys avocado but wants a fresh take on an endless parade of guacamole variants, you and your mouth are about to be very happy indeed. 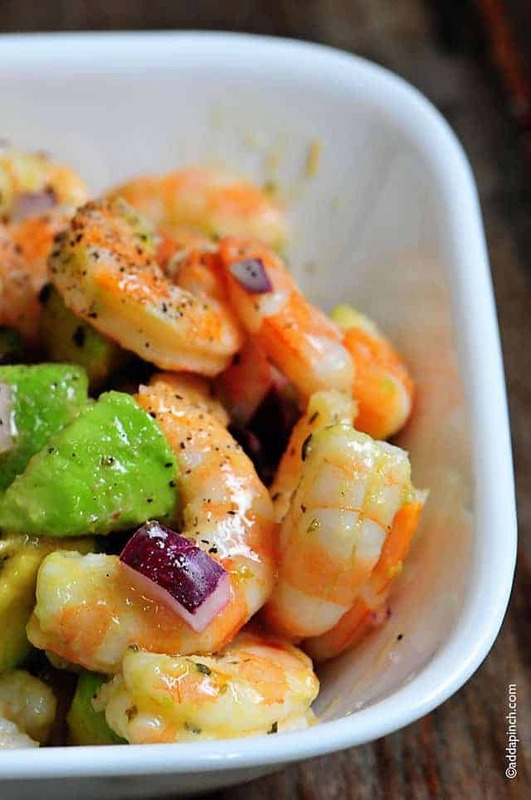 Enter the Spicy Shrimp and Avocado Salad. Artfully presented in the hulls of the fruit itself, these cold salads make great appetizers or light meals, and are a great way to please everyone’s palate while using up leftover ingredients (frozen shrimp, anybody?) or those last odd bits of fresh produce. Oh, and spice-heads, there’s Sriracha in here, too. Yum! Another stir fry, this one is full of Asian flavors and satisfying crunch. There’s fresh asparagus and sesame seeds to counteract the juiciness of the shrimp, while the ginger and soy sauce will add a pleasant flavor base for the secret ingredient – brown sugar. 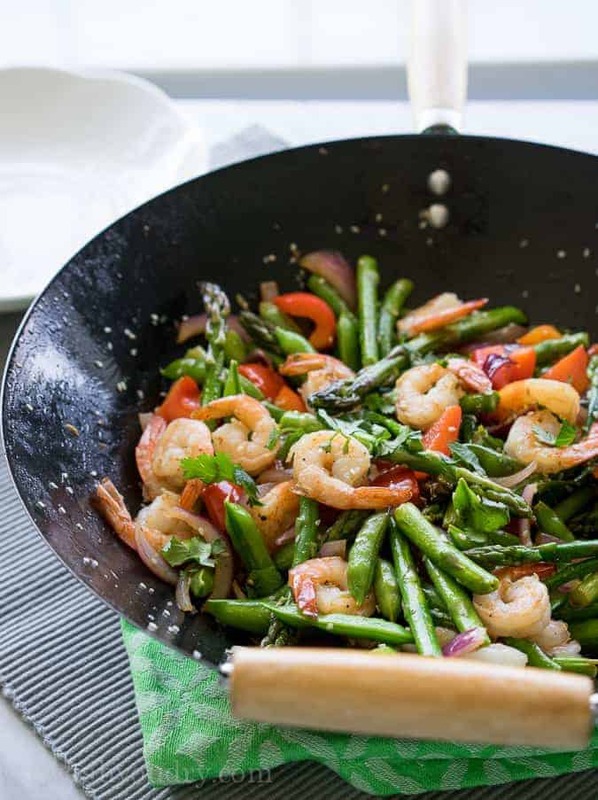 Throw in snow peas and a few other ingredients, and you’ve got yourself a delicious low-carb shrimp recipe that’s fit for a king (or a busy weeknight). This next recipe is beneficial on several levels beyond simple great taste. For one, it’s gluten-free, so folks with problems in that area can chow down to the point of immobility. Second, it’s a great way to get your RDA of veggies. Third, it’s obviously a great way to cut down on carbs, being an almost no carb shrimp recipe. 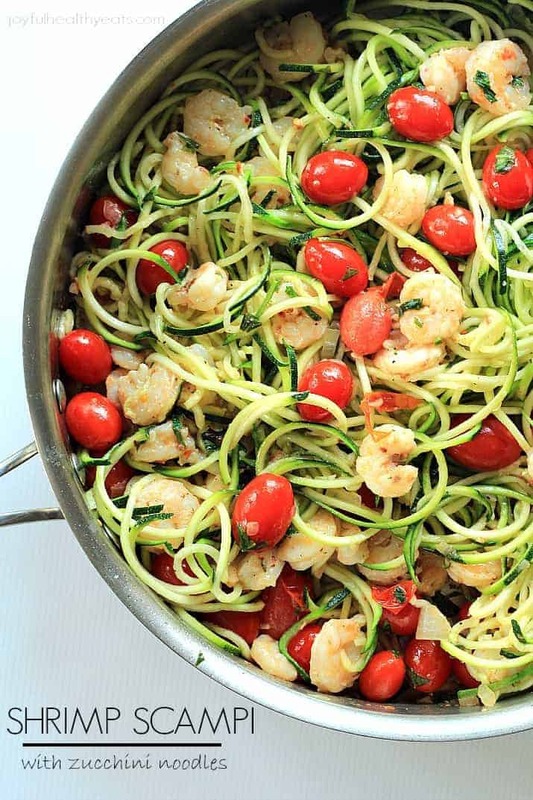 In fact, you might find that you enjoy Zucchini Noodles with Garlic Shrimp so much that it becomes a staple in your home. Just toss the shrimp in lemon, garlic, paprika, some fresh parsley, and a few other things, make the “pasta”, and you’re set to go. Eat hearty with zero guilt? Sounds good! Some people say you can’t have all the good things the pantry has to offer if you switch to a low-carb diet. Some people say you can’t eat well and be health-conscious at the same time. Some people are wrong. 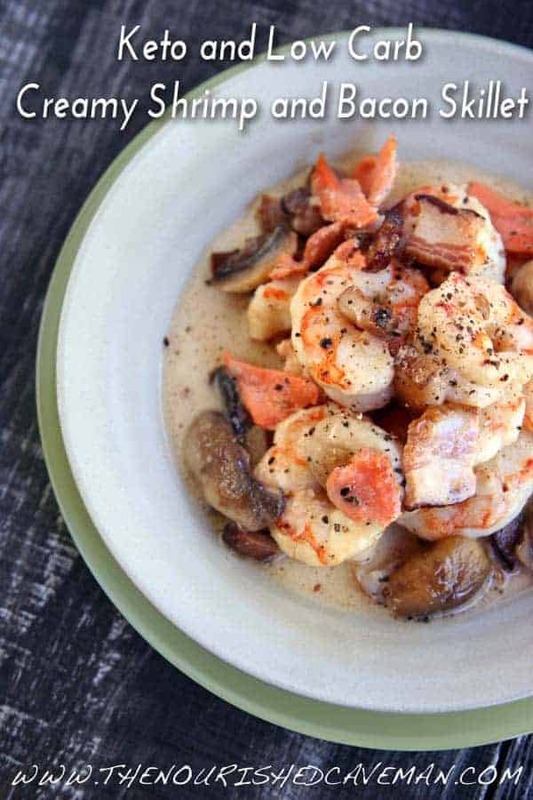 This innovative take on classic shrimp and grits is one of the coolest low-carb shrimp recipes around. Yes, it’s healthful and yes, it tastes good, but it’s the sheer ingenuity and creativity of it that’s truly impressive. If you’re searching for some virtually carb free shrimp recipes to add to your rotation, do yourself a favor and make sure this is one of them. Is there anything more refreshing than a great summer salad? 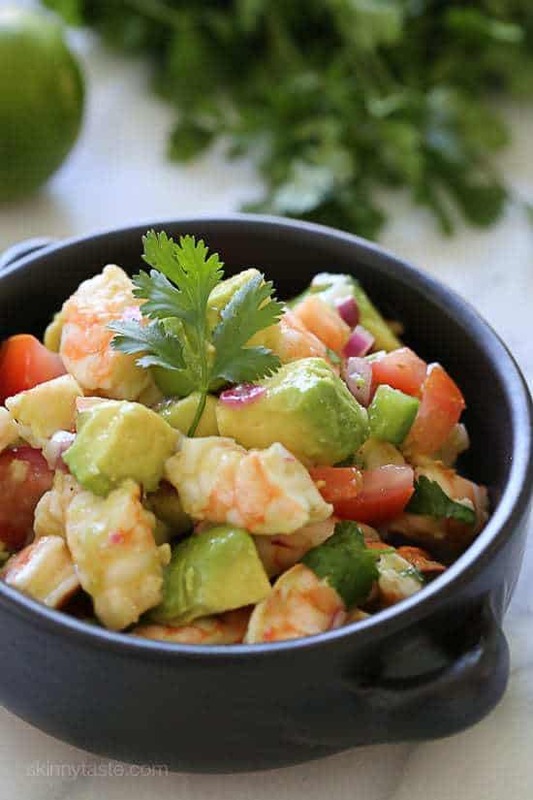 This Zesty Lime Shrimp and Avocado Salad is almost a ceviche, yet for something with more flavor than you can shake a fork at, it remains firmly on the list of low calorie shrimp recipes. Oh, and there’s more – you can easily expand this dish to fit party-sized crowds, or else shrink it down for just one or two people. You can also prepare it ahead of time if you want, although the time it takes to make it is already scant. In short, there’s no reason not to give this dish a shot ASAP! Looking for an elegant, easy appetizer for your next get-together? Why not try these? Equal parts flavorful and whimsical, they’ll have your guests asking for more even as they squabble over the last one on the platter. 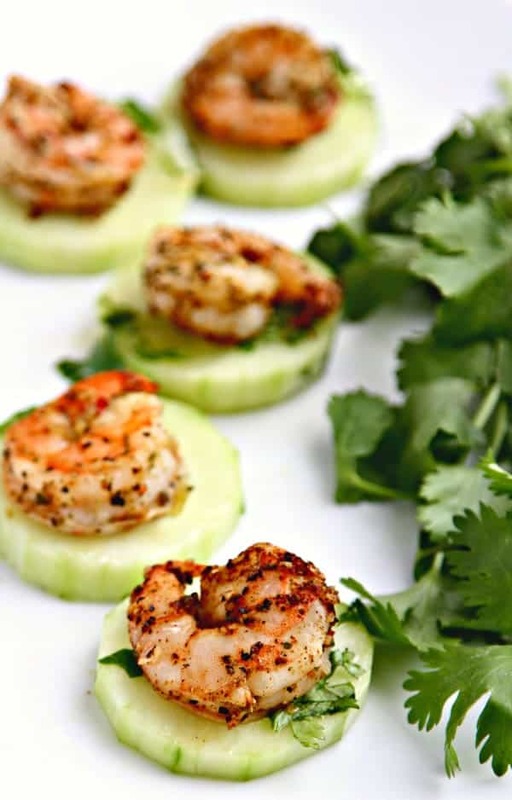 Blackened shrimp gives a great burn, but the cucumber circles they rest upon provide cooling refreshment. As far as preparation is concerned, the only thing quicker than the prep time for this dish is how little time it’ll take for the last bite to disappear! 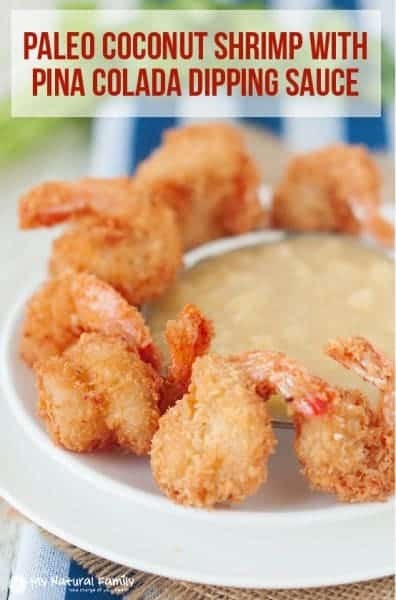 Coconut shrimp is probably one of the most classic shrimp recipes ever, and now it’s got a low-carb twist. 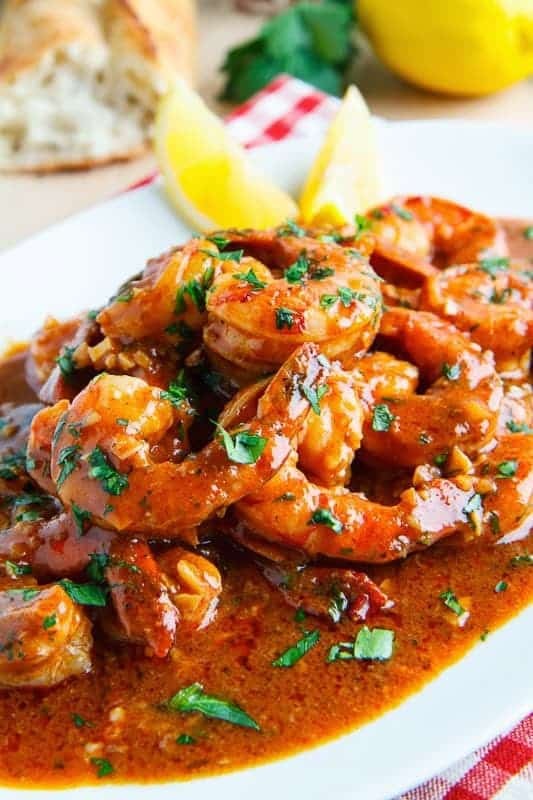 Sweet, crunchy, spicy, and juicy all in a measure, this is one of those coveted (almost) carb free shrimp recipes – provided, of course, that you can restrain yourself to one serving at a time! Fancy a taste of the Land of Smiles? 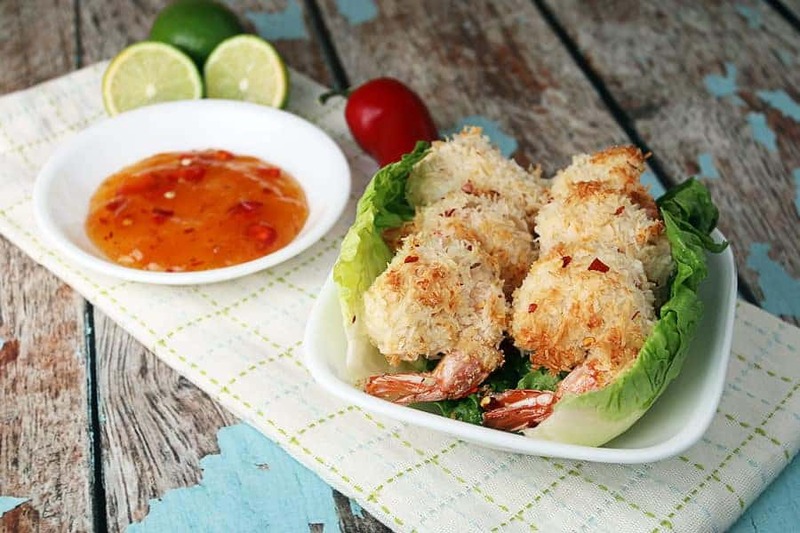 Make your mouth happy then with these Thai Shrimp Lettuce Wraps! 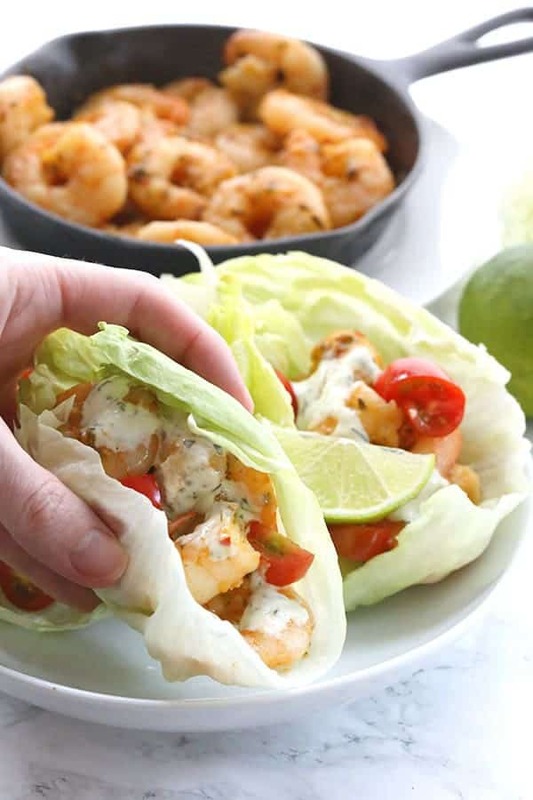 Thai-spiced shrimp, cilantro-lime mayo, and veggies are wrapped in lettuce leaves to provide an appetizer for four to six people or a meal for two. 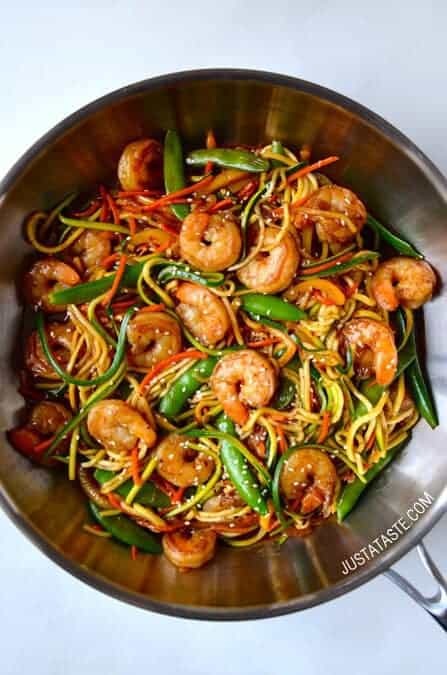 Carb-free shrimp recipes (or at a hair over 5g of carbs, as close as you’re likely to find) don’t get any simpler than this. If you’d like a basically no carb shrimp recipe that would be perfect for date night, try this. 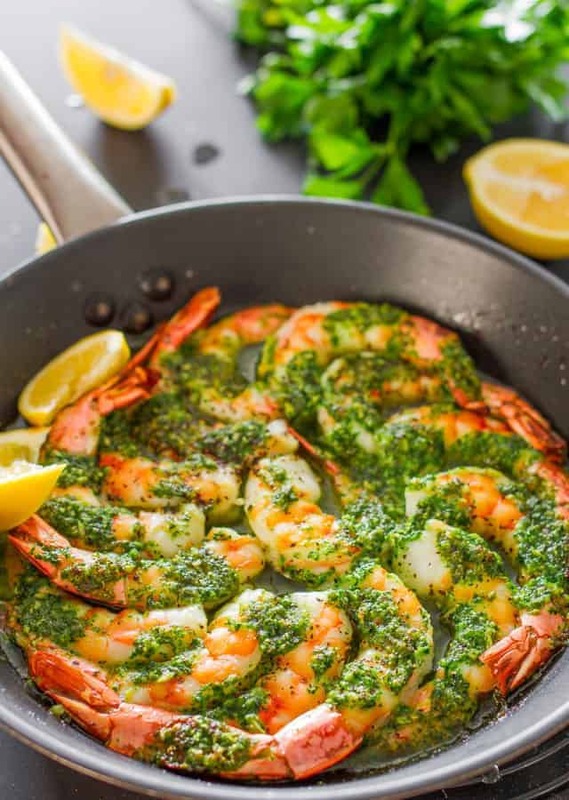 The bath of lemon, parsley, and garlic butter you’ll be giving your shrimpy friends will elevate them from merely good to something sublime – and it’s so easy to put together that even the kids can help. 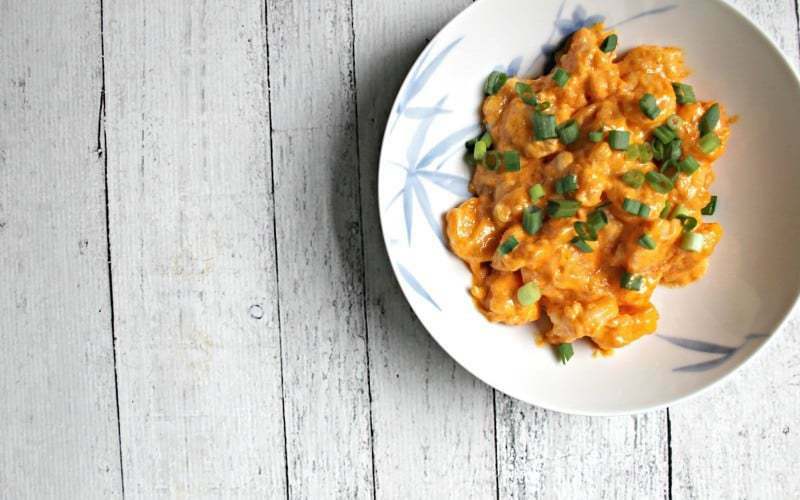 The first entry on our list of low-carb shrimp recipes to be explicitly Paleo in nature, this humorously-labeled dish is what might happen if some wild-caught shrimp and buffalo chicken had a baby. A tasty, tasty baby. Think of this dish as wild-caught popcorn shrimp in Sriracha, and you’ll have some idea of what you’re in for. 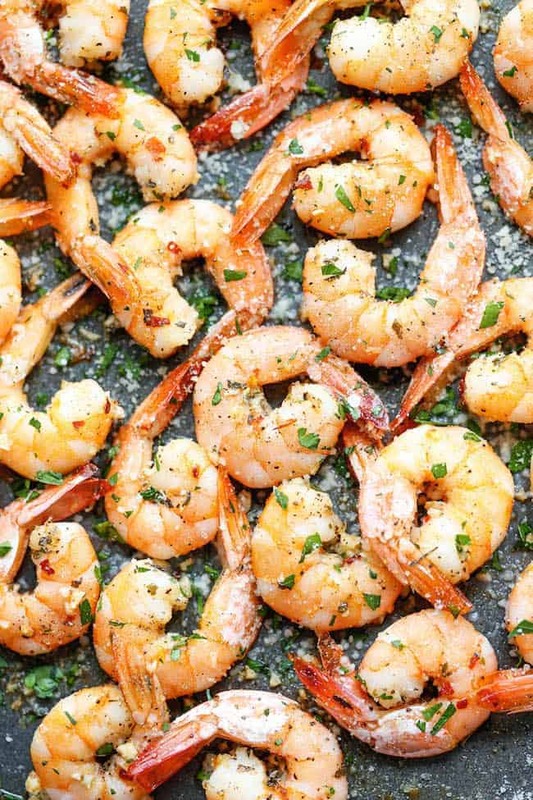 Need a low-carb twist on shrimp scampi? Try this! It might lack carbs, gluten, cholesterol, and a bunch of other nasty stuff, but the flavor you get in every bite more than makes up for it. Better still, you can get it from skillet to plate in under 30 minutes – perfect for a Friday night feast when time presses. Another zucchini-based stir fry, this one is almost a lo mein in its texture and consistency. Of course, flavors and nutrients are the only things this homespun Chinese takeout will bring you; you’ll have to find your own fortune cookie. Looking for a low-fat, low-carb appetizer for your next game day get-together? Look no further. This take on a classic shrimp recipe delivers all the flavor and crunch of the original while skipping the carb-coma. 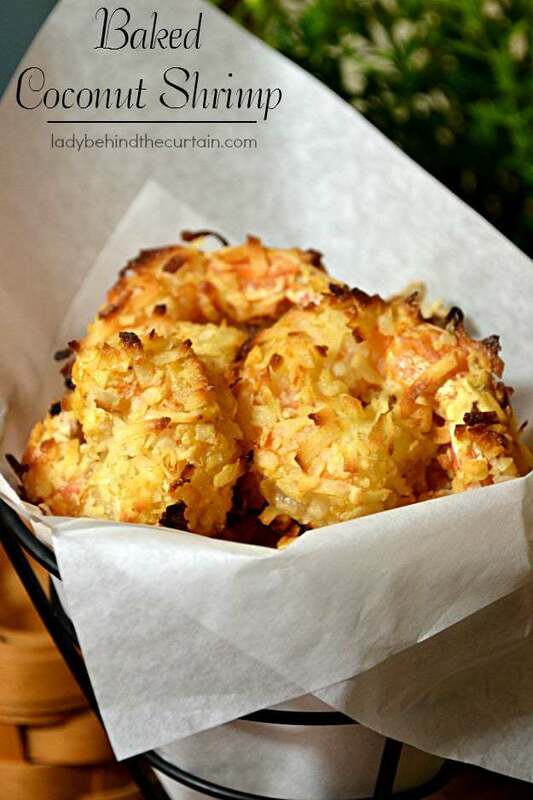 It even gives you a pass on the oily mess you might get from other low-carb recipes that require frying your coconut shrimp. Give ’em a shot! In much of the world, summertime is fast approaching, and that means one thing: It’s time to dust off the grill! Of course, where there’s a grill, there’s grilled food, and what better way to innaugurate the season than by trying these shrimp & sausage kabobs? The formula is as old as time itself, and why fix what isn’t broken? 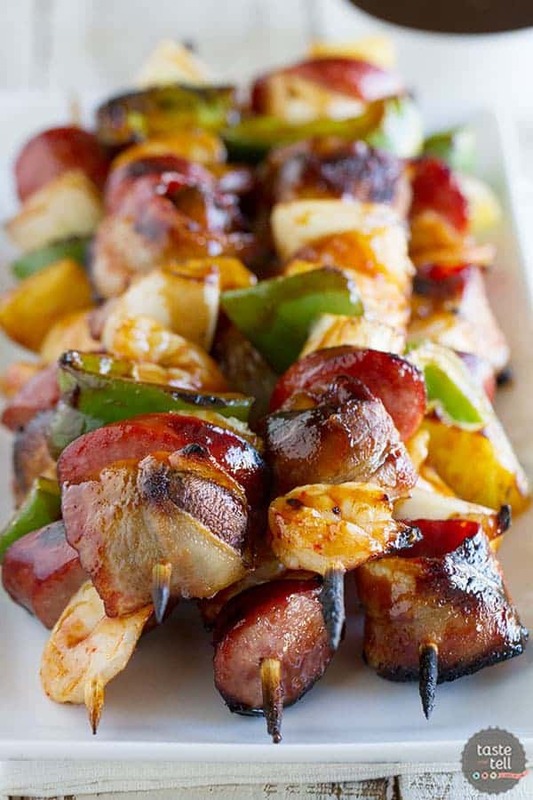 Skewers jam-packed end-to-end with meat and veggies covered in a sweet and tangy glaze – if your mouth isn’t watering just reading that, you may want to check your pulse. The title of this recipe says it all. You take a pound of shrimp and dress it up in some garlic, butter, olive oil, and lemon, sprinkle a little sea salt on, and boom, you’re done. With cooking, ingredient prep, and all, you can have this on your plate in less than 20 minutes (and that’s if you’re slow about it). Yum! On a hot day, there’s nothing better than a gigantic summer salad to cool you down and fill you up without making you feel like you just ate a horse. 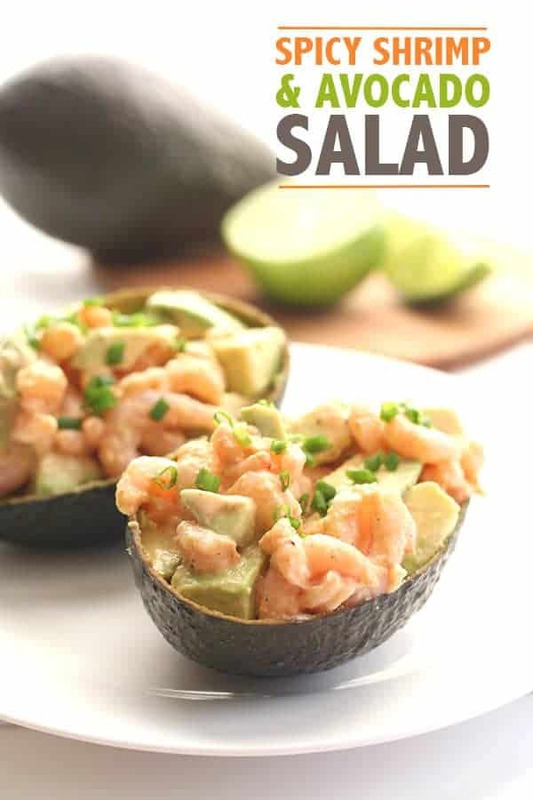 This low-carb shrimp recipe is just such a salad, combining avocado, Dijon mustard, crisp veggies, a multiplicity of seasonings, and of course, lots of fresh shrimp. It only takes 20 minutes to make enough to serve six, and you’ll be scraping the bowl at the end. 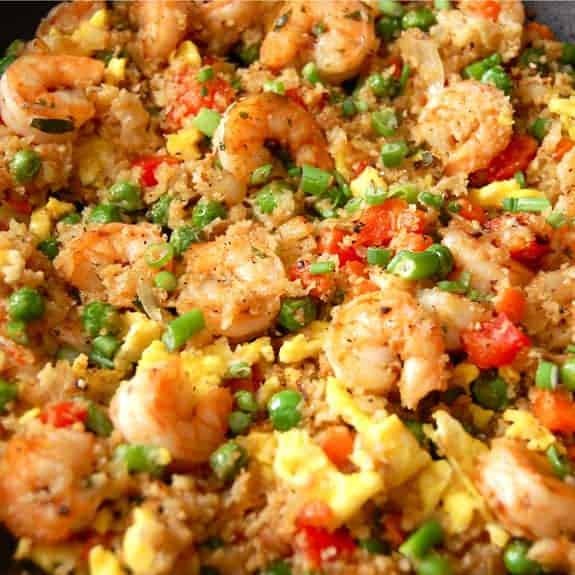 Another Paleo Diet entry, this Shrimp Fried Rice will fill you up without weighing you down or blowing you out. Coconut oil makes an appearance (this is a Paleo recipe, after all), and ordinary rice has been forsaken in favor of a low-carb cauliflower substitute, but everything else is just as you’d expect – there’s tons of crisp vegetables, scrambled eggs, lots of flavorful seasonings, and more. You’ll just have to whip up a batch if you want the, uh, skinny. 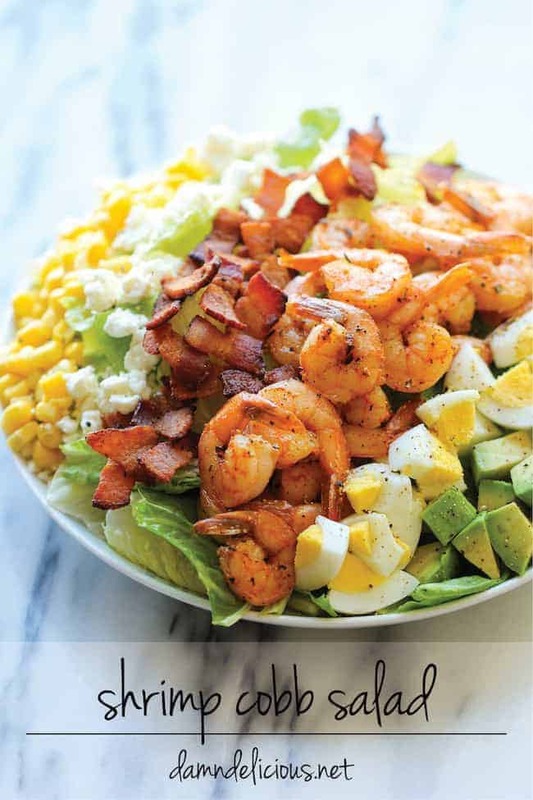 Another entry into the salad category, this low-carb shrimp recipe is a Cobb salad on steroids. Overflowing the plate with greens, eggs, corn, avocado, eggs, bacon, cheese, shrimp, and homemade dressing, you could probably make two meals out of this (or share it with a very lucky friend). 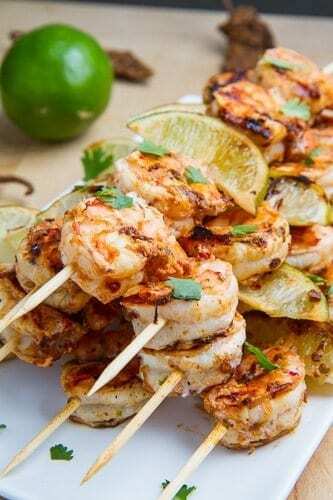 Marinated grilled shrimp. 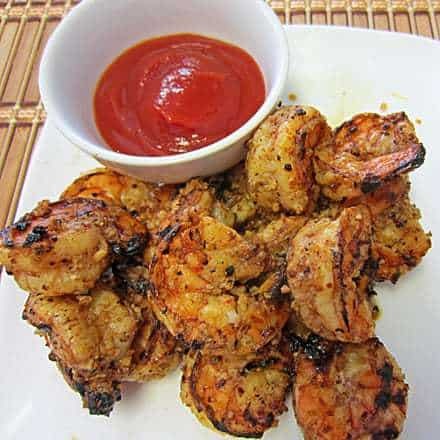 Honestly, that’s enough of a description, but for the folks who enjoy digging a bit deeper into virtually carb-free shrimp recipes like this one, this particular low-carb shrimp recipe goes something like this: You take a pound of shrimp, marinate it in some lemon juice, Worcestershire sauce, and spices, and throw it on the grill. Then comes the fun part, in which you attempt to restrain yourself from burning your mouth as you eat said shrimp straight off of said grill. In a rush but still want something tasty, filling, and good for you? Try this recipe on for size! 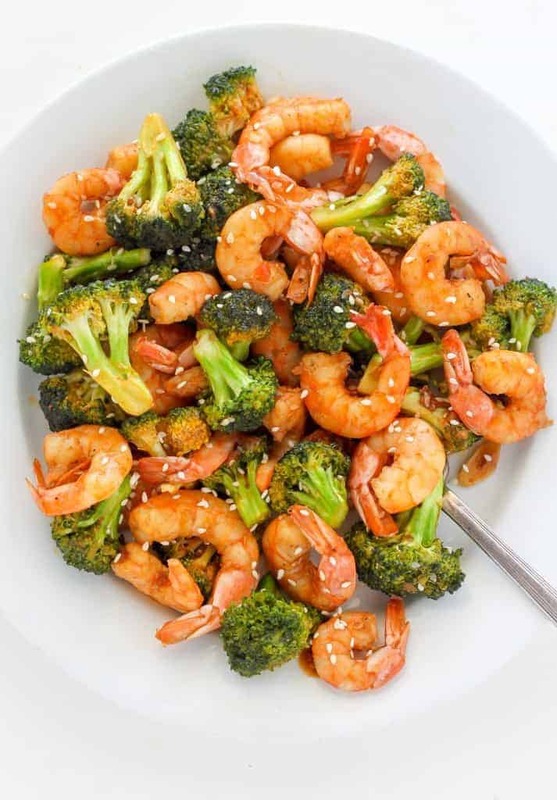 Plump, juicy shrimp and fresh, crunchy broccoli come together in the loving embrace of a homemade Sriracha soy sauce to form a dinner that’s sure to be a favorite. 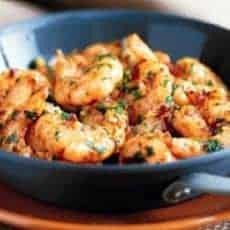 In fact, it’s probably fair to say that this is one of those low calorie shrimp recipes you’ll be returning to again and again. Of course, the only way to know for sure is to cook up a batch for yourself! This next recipe is a hunter’s dream. Full of wild-caught shrimp and salmon, plus plenty of bacon, mushrooms, heavy cream, and a bunch of other great-tasting stuff, the smell will have your mouth watering well before it hits the table. Speaking of which, it might start out as a skillet meal, but it ends up as more of a hunter / fisherman’s stew. This traditional Brazilian dish isn’t just easy to make and mind-bendingly delicious. 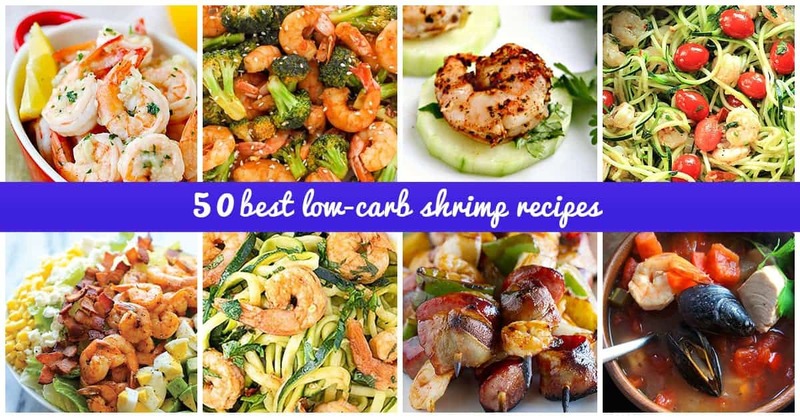 It also manages to be maybe the mother of all low-carb shrimp recipes, being, as it is, compliant with three separate low-carb eating plans. To prepare, saute & simmer everything in a single skillet, garnishing with extra cilantro when the time comes (you want all the flavors to meld during the cooking process). Serve hot. If there’s one place that knows how to do shrimp right, it’s New Orleans. Grab a napkin or 500 and dig into these bite-sized masterpieces – if you can stop at one, you’ve got more willpower than most. Swimming in a sauce made with Worchestershire, hot sauce (come on, this is Louisiana! ), lemon juice, some Creole seasonings, and a healthy dollop of butter, among other things, this is a recipe that’s sure to please. NOTE: If you’re not a beer drinker, feel free to omit it from the list of ingredients. Making its second appearance, Bang-Bang Shrimp is back – and this time it has a sidekick. 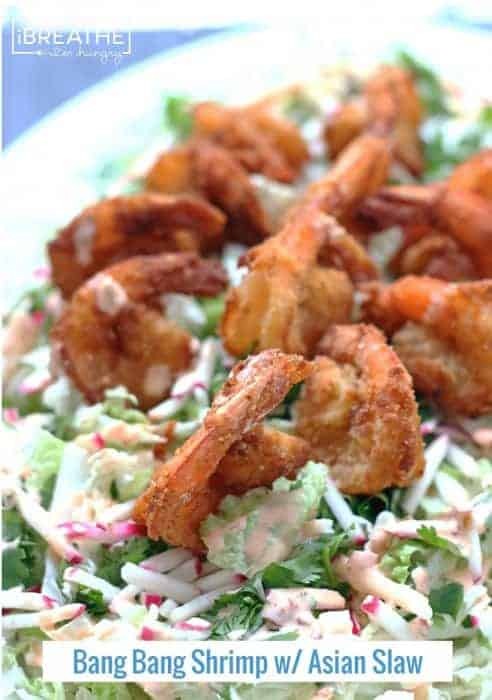 Just in case you’re the sort for whom a powered-up variety of spicy coconut shrimp is too awesome (hey, some people just can’t handle their Sriracha), a cooling bed of Asian slaw is here to take some of the tasty, tasty sting out of these guys. Just don’t be surprised if you spurn your local takeout place from here on out – this stuff is delicious! Were you a fan of Alfredo in your non low-carb days? Well, there’s good news: You can have your pasta and eat it, too, more or less. Behold: Spaghetti Squash Shrimp Alfredo! Chock-full of all the homey goodness that has made the original such a comfort food classic, this dish has been tweaked to make it a low-carb sensation, swapping out the pasta for spaghetti squash and adding in some shrimp for a bit of seafood flair. Mama mia! Do you like shrimp salad? How about buffalo wings? Well, imagine they got married, lived happily ever after, and had a bouncing baby, uh, foodstuff. That little tyke would be this recipe. 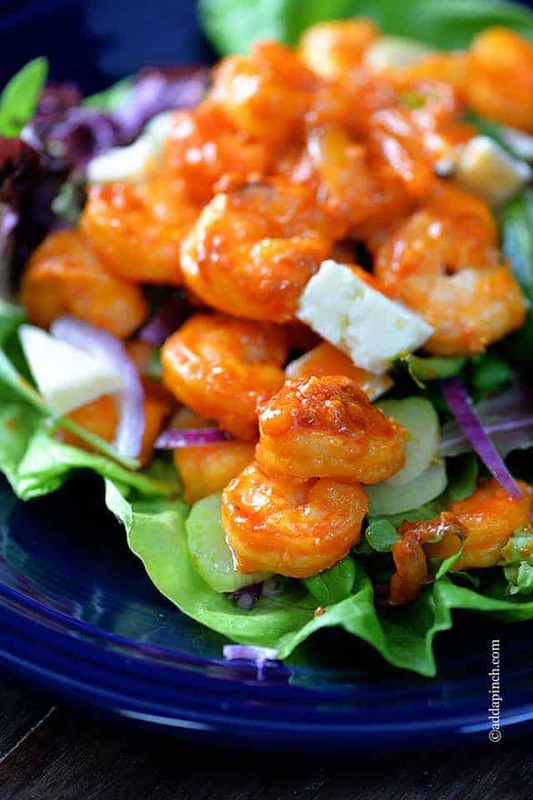 Crisp greens form a foundation for the crown of this salad, which consists of a delicious spicy shrimp concoction. It even has cheese crumbles. Just don’t forget the napkins – you’ll need them. If you like pina coladas, getting caught in the rain, or really good low calorie shrimp recipes, then this is the meal for you. 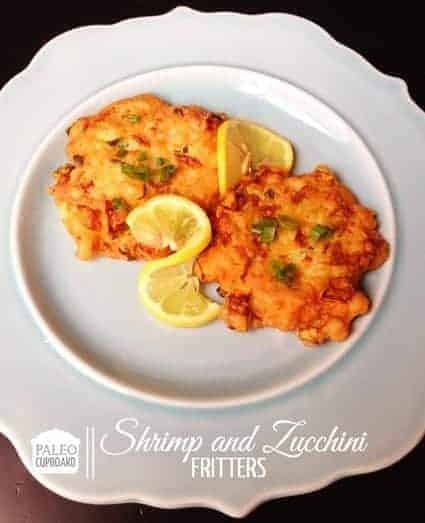 A Paleo Diet approved dish, this version of Coconut Shrimp uses natural ingredients to give you all the bang with none of the bloat. Simply embrace your inner caveman and cook, dip, and enjoy, guilt-free. Egg Foo Young is a Chinese takeout staple. It also happens to be a great way to use up your leftovers, be they eggs, meats and seafood (like shrimp), or vegetables. Of course, when you make it at home like you will using this recipe, you have the advantage of being able to cut out all the bad stuff, thereby keeping the taste and axing the stuff that causes all the baggage around your middle. 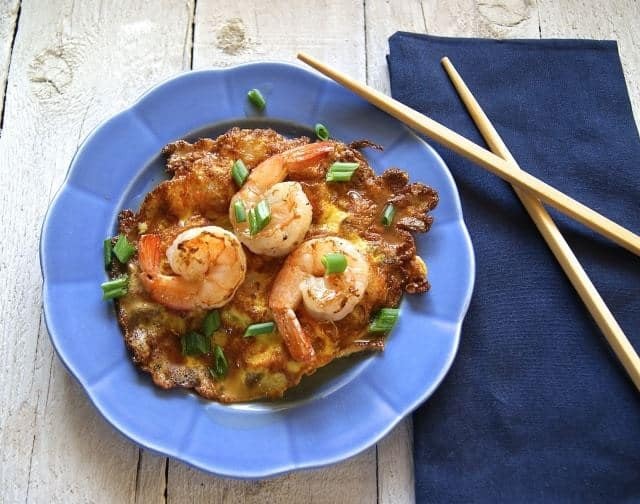 Curious to see how a Chinese omelet topped with shrimp might taste? Well, get cooking then! Feeling under the weather? Maybe it’s chilly outside. 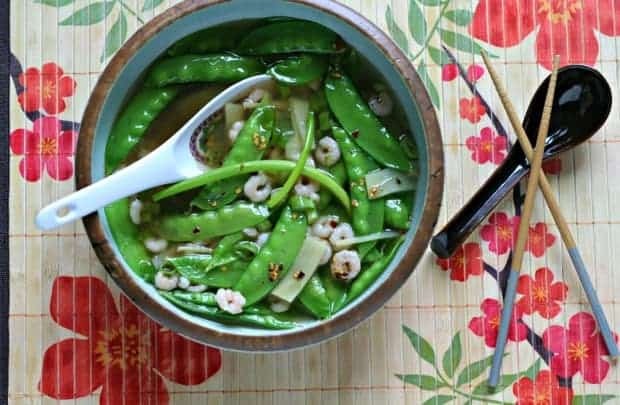 Either way, soup is on the menu, which means it’s time to try a bowl of this delicious, nutritious, and speedy Quick Shrimp and Snow Pea Soup with Ginger. 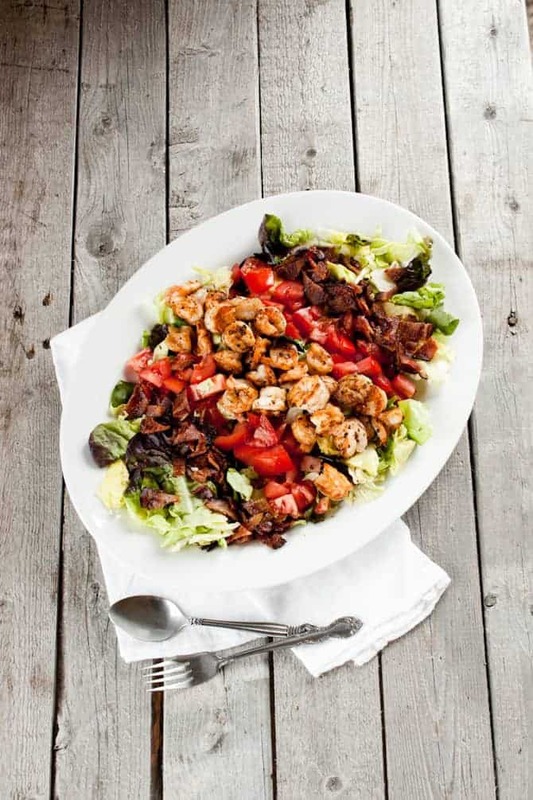 Some low-carb shrimp recipes can be kind of involved in their preparation, but whipping up this one couldn’t be easier. Simply toss everything in a pot, boil + simmer, and serve. Hint: Leftover stock, if you have it, works great with this recipe. “Oh boy, another shrimp salad!”, you must be thinking. Well, think again. This isn’t just another identical offering in a long parade of indistinguishable no carb shrimp recipes. In fact, it’s a deconstructed spring roll bursting with all the flavors of Thailand. You’ve got shrimp. You’ve got veggies. You’ve got almond butter sauce (in place of the ubiquitous peanut sauce). You’ve got toasted nuts for crunch. The only thing that’s missing is the carb-load. So go on, stuff yourself – they don’t call Thailand “The Land of Smiles” for nothin’. Are you on the Whole30 Diet plan? If so, this dish is just for you. Almost like tiny salmon patties, these things are like tiny little taste-bombs. 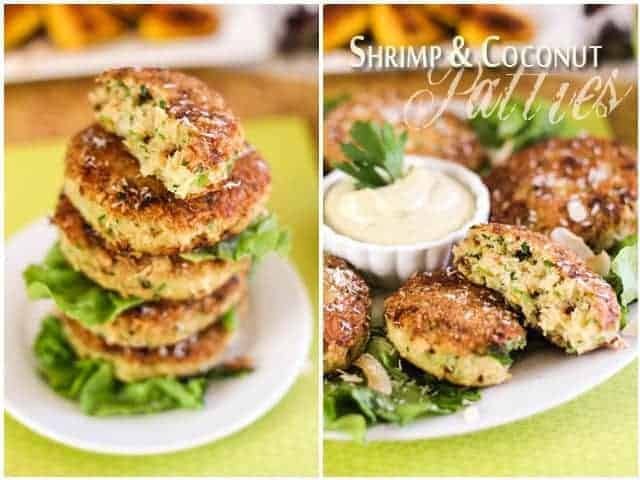 Shrimp, chile, coconut, lime, Dijon mustard, and about a million other things go into making these quarter-sized patties; the avocado-mayo dipping sauce, which is the garnish, is just what it sounds like. These little guys would be just as comfortable at a society brunch as they are in your own home. 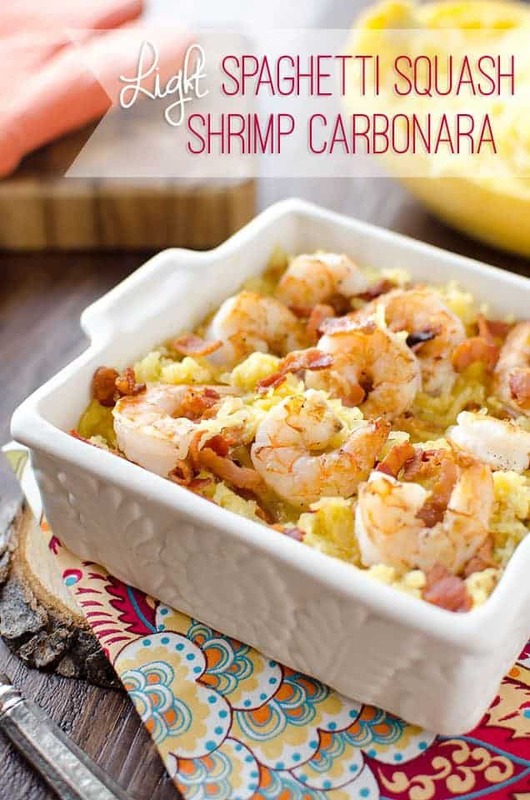 Who said low-carb shrimp recipes are bland and unfulfilling? Mmmm-mmm! 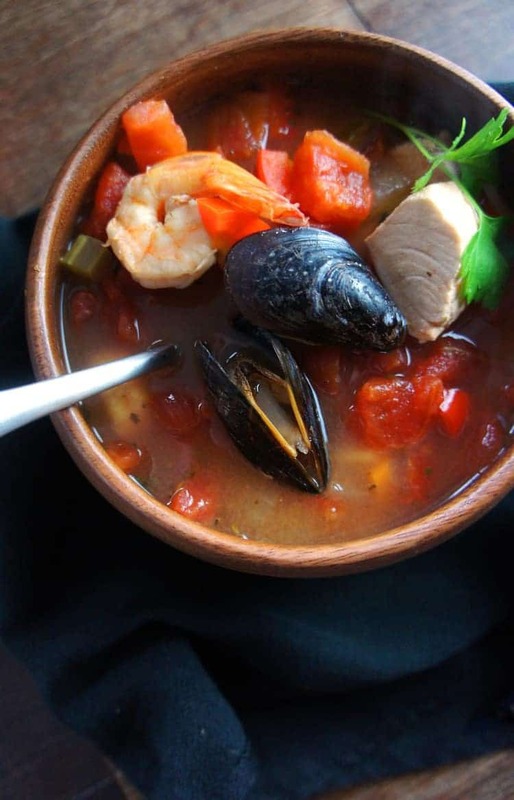 Cajun food is some of the best cuisine on the planet, and as luck would have it, you can adapt it to your low-carb needs with very little work. Take this jambalaya recipe, for instance. Simply exchange the rice for a cauliflower variant, and boom – you’re good to go. 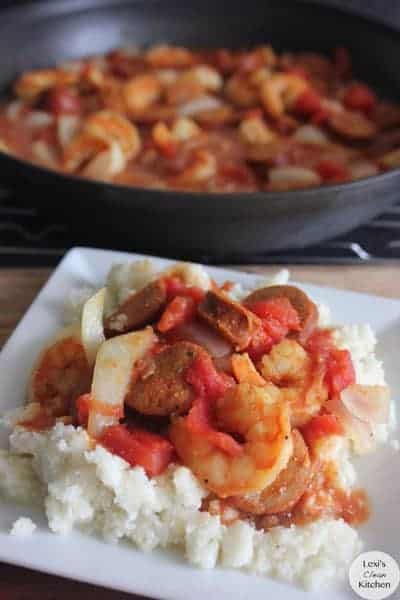 After that, it’s simply a matter of topping it with shrimp, Andouille sausage, and all your other favorite meats, vegetables, and seasonings. Quick, easy, delicious. Who could ask for more? 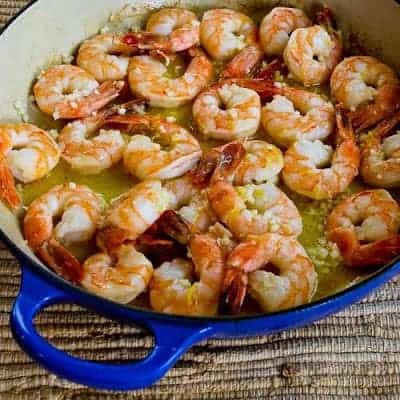 Another Shrimp Scampi recipe, this dish serves up to six people, but don’t be surprised if you find yourself jealously guarding a plate meant for two! 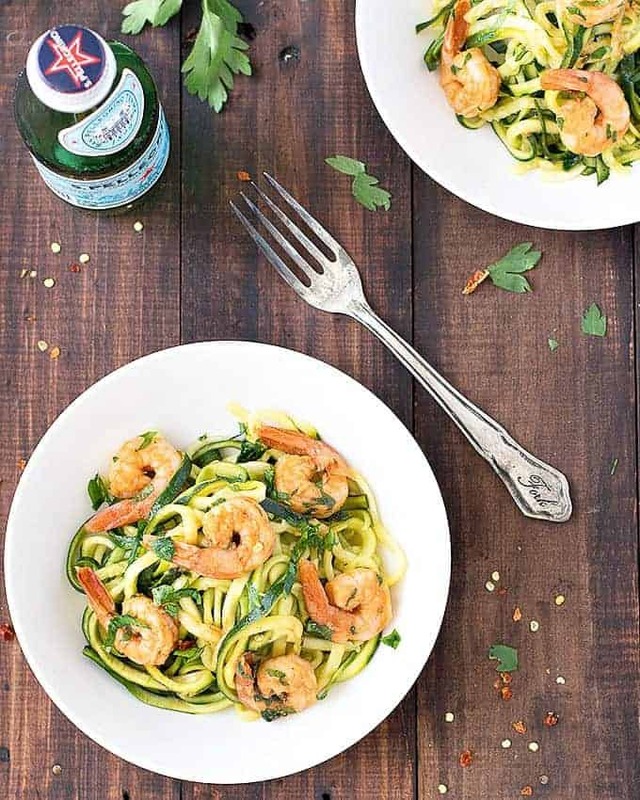 Yummy zucchini noodles, vegetables and shrimp done to perfection, and just a hint of white wine and seasoning make this a dish you’ll be making over and over again (especially since it only takes a half an hour to get from pan to plate). Are you a gardener? If so, you probably have plenty of extra vegetables just waiting to be used in a few low-carb shrimp recipes. If zucchini happens to be one of them, why not try out these Curried Zucchini Fritters? Light, crisp, and just the right level of spicy, these fritters will have the whole family saying “More, please!” Top them with the included spicy shrimp and serve with a bit of low-carb dipping sauce. 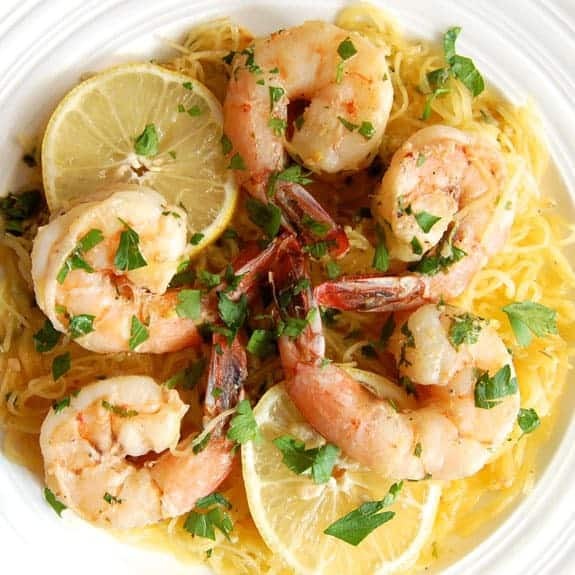 Shrimp Scampi’s final appearance on this list, this one’s made with spaghetti squash. Beyond the difference in “pasta” choice, you’ll be getting the same light, lemon-y, creamy goodness that keeps bringing folks back to this classic Italian dish night after night. Dig in and enjoy! The BLT. Is there anything more quintessentially American? Maybe making it in salad form and eating one on Independence Day, as the recipe author suggests. 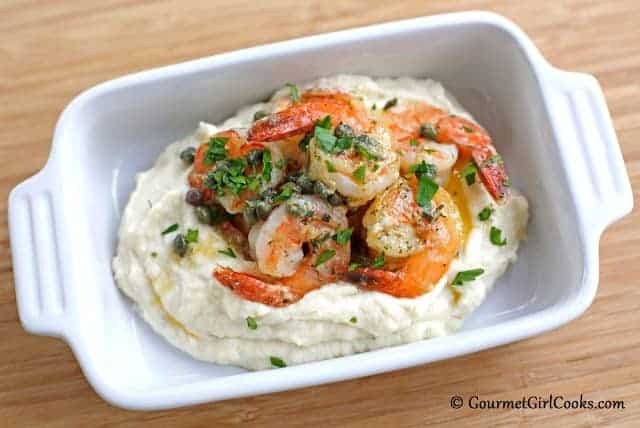 Speaking of which, you’re actually getting two recipes for the price of one here, as the heart of this dish is the author’s Garlic Butter Shrimp. Add that to bacon, greens, vegetables, and some avocado if you’re feeling frisky, and presto, you’ve got a salad that’ll send off fireworks in your mouth. Feel like giving summer an early shoe-in (or, for some of you, one last hurrah)? Try these micro lettuce wraps! 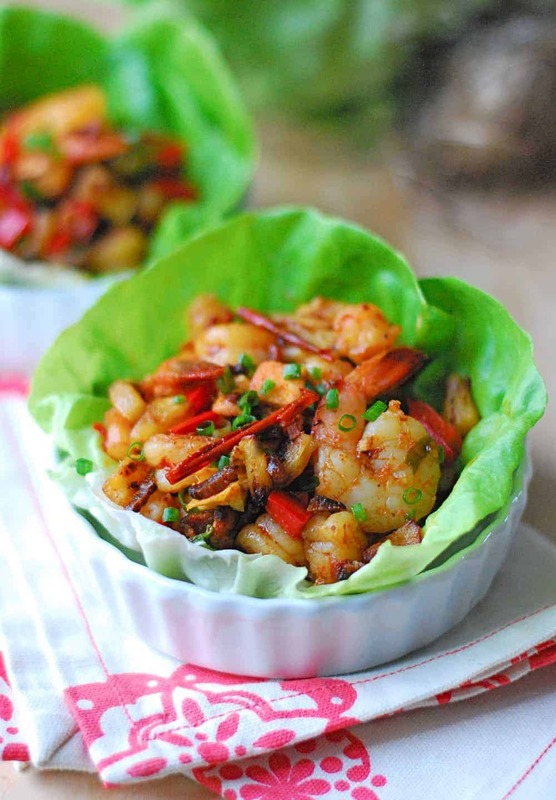 Sweet and spicy all at once, they’ll send your mouth on a vacation so good you’ll forget that all the shrimp, vegetables, protein and vitamins in these little lettuce cups are actually good for you. And hey, if you remember by accident, there’s bacon to make you forget again. If you like seafood, grab onto something and hold on tight – you may faint from exuberance. 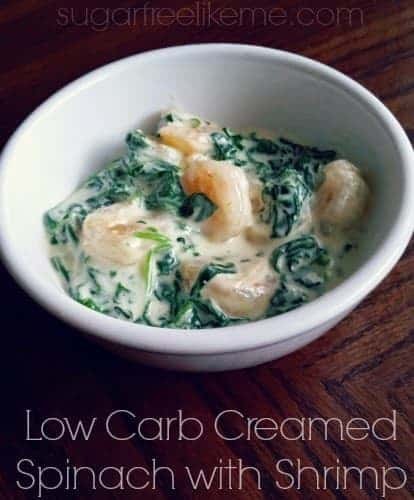 This is one of the magical low-carb shrimp recipes (verging on carb free shrimp recipes) which somehow manages to be good for you while cramming in so much flavor and simple food that you can scarcely believe it even exists, let alone that it’s nutritious. Not only is there shrimp in this dish, but there’re three other kinds of seafood, plus more vegetables, seasonings, and spices than you can shake a ladle at. This is one dish you won’t want to share. There are nearly infinite ways to cook shrimp, but sometimes, the simple ways are best. Garlic Lemon Chili Butter Prawns, for example, are astoundingly basic to prepare, but the enjoyment you’ll get out of eating them is worthy of any king’s feast. For the curious, they’re just what they sound like: Succulent tiger prawns sauteed in mouthwatering spices and flavors. Are you drooling yet? Want a quick “clean out the fridge” style appetizer? This last entry in our shrimp recipe guide is right down your alley. 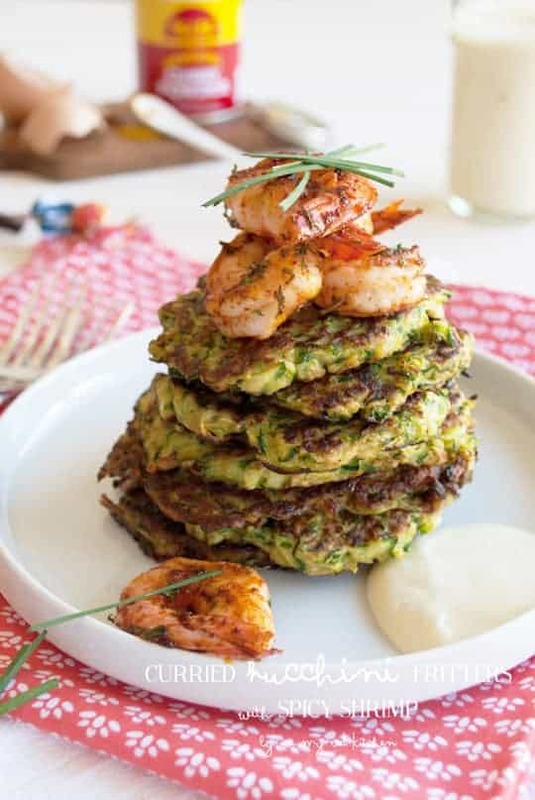 These Paleo Shrimp And Zucchini Fritters can’t quite claim to make it into the ranks of “carb-free shrimp recipes” (nothing on this list can), but like most of what you see here, they come pretty darn close! They’re quick and easy to make, they pack in tons of flavor with an equal amount of vitamins and nutrients, and better yet, they’re light on the stuff you don’t want, specifically fat and carbs. Can you stop at just one? 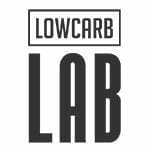 Low-carb foods are a great way to kick-start and / or maintain a balanced, healthy lifestyle. 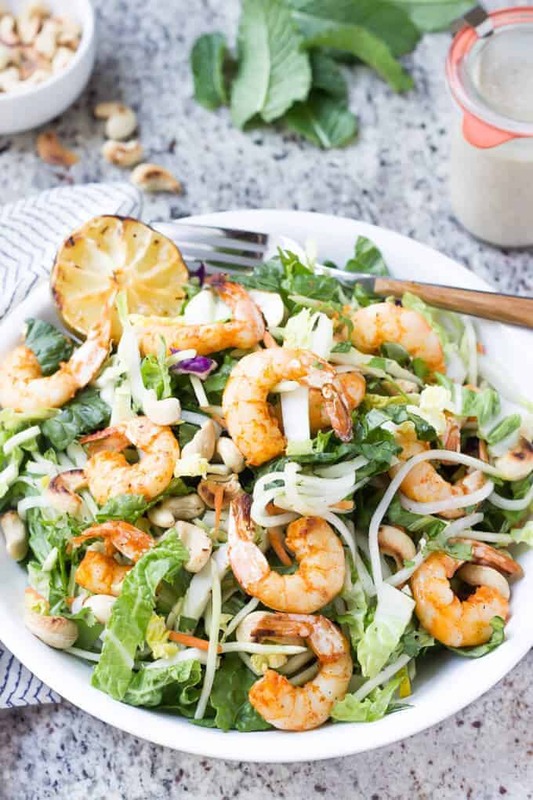 Whichever step of the nutrition path you happen to be on, there’s one thing for certain: Thanks to this handy shrimp recipe guide, you should have no shortage of ideas on what to make for dinner! Thanks for reading, and enjoy.